How real is Los Angeles' notoriety for rainy weather driving? FILE: The rains have El Niño are already testing L.A. drivers, but are they really the worst at navigating wet roads? 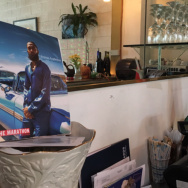 With all this rain and chaos on the roads, we wondered: do Los Angeles motorists really deserve the oft-repeated rap that they can’t drive in the rain? Between hydroplaning big-rigs and disaster-sized backups, things certainly seem crazier than usual on our rain-drenched roadways this week. And they probably are. 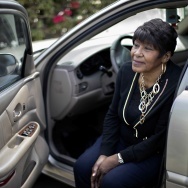 Data abound on how crash rates double in L.A. during rainstorms. Noah Deneau, an electrical engineer and data enthusiast, created a visualization of California Highway Patrol crash numbers for L.A. freeways covering a decade, comparing collision rates during rain against dry weather averages. He found crash rates increased up to 100 percent during certain periods of the day. A visualization of crash rates on L.A. freeways from CHP data shows how they increase during rain in blue. But are L.A. drivers unique in their inability to handle wet roads? "Absolutely not," said Paul Pisano, who manages road weather programs for the Federal Highway Administration and has studied the topic. He cites several studies that show injury collisions double or even triple during bad weather across the country. 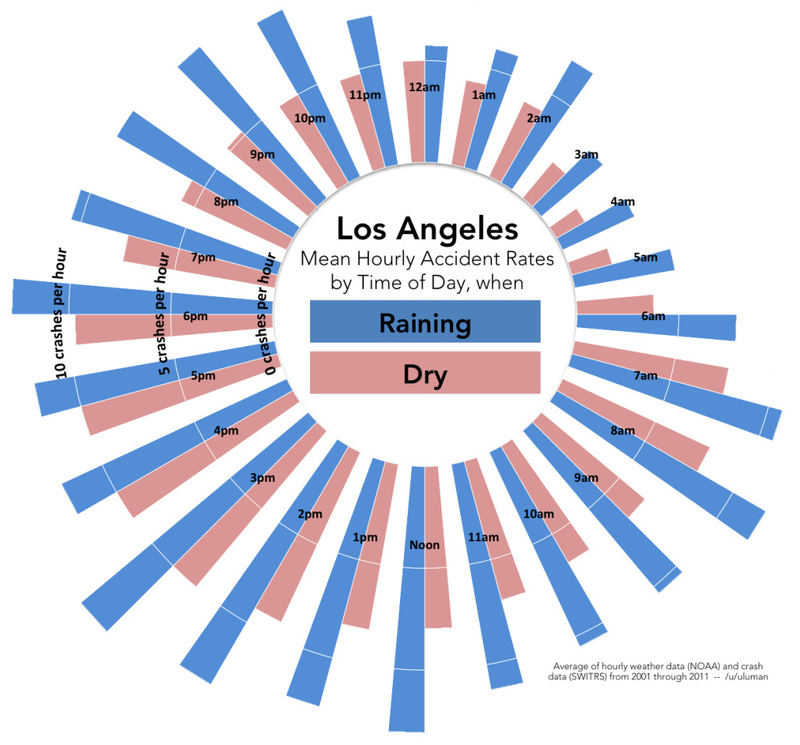 So Los Angeles drivers are just average when it comes to rainy weather collisions. A list compiled by insurance company Allstate ranks cities in the Northeast among the top for bad driving leading to insurance claims. Boston and Washington, D.C., lead the list for poorest driving in snow and rain, and Glendale in California, makes it into the top 10, placing sixth. Pisano admits that his own experience driving in L.A. during the rain was pretty nightmarish. The high traffic volumes on the roads here can tend to exacerbate drivers' experiences, he notes. However, L.A. drivers may have legitimate excuses for slipping and sliding on wet roadways, given the Mediterranean climate. "After a long dry period, there is certainly grime, oil, other materials on the roads, and when you have the first rain of the season, they rise to the surface," he said, causing hazardous conditions. The good news, according to research by public health professor Daniel Eisenberg, is that the roads and our driving habits tend to improve as the rain continues. And since we'll be seeing more of it this week, accidents should decline. The bad news is that once we get back to a dry spell, we forget what we learn and road conditions worsen once more. So come another rainy period — and we're told to expect many with this season's strong El Niño — accidents will spike again. What do you think: do we deserve our bad reputation as drivers in the rain? Tell us in the comments below or tweet us @KPCC.